Premium-quality micrograin carbide tips are ground on specialized CNC equipment for an extra-fine finish with maximum sharpness and edge retention. 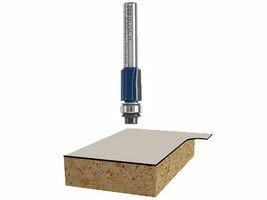 Shear trim bits are used for laminate work or for template and pattern work. For template application, the bearing follows the template, while the cutting edges trim the work piece. Double flute trim bit allows for a smoother finish. The fully hardened and tempered steel shank provides ultimate durability.